Featured amenities include a business center, express check-out, and a 24-hour front desk. Planning an event in Meriden? This hotel has facilities measuring 286 square feet (27 square meters), including a meeting room. Free self parking is available onsite. 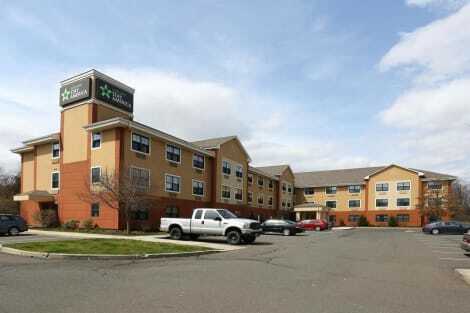 With a stay at Extended Stay America Hartford - Meriden in Meriden, you'll be within a 15-minute drive of Toyota Presents Oakdale Theatre and Saint Johns Field. This hotel is 7.7 mi (12.4 km) from Wesleyan University and 1.1 mi (1.7 km) from Hunter Memorial Golf Course. Enjoy a satisfying meal at Vending Area/Snacks serving guests of Hawthorn Suites by Wyndham Hartford Meriden. Mingle with other guests at the complimentary reception, held daily. A complimentary continental breakfast is served on weekdays from 6 AM to 9 AM and on weekends from 7 AM to 10 AM. Make yourself at home in one of the 97 individually furnished guestrooms, featuring refrigerators and microwaves. Wired and wireless Internet access is complimentary, while 32-inch LCD televisions with cable programming provide entertainment. Bathrooms have complimentary toiletries and hair dryers. Conveniences include desks and coffee/tea makers, and housekeeping is provided daily. Make yourself at home in one of the 91 guestrooms featuring refrigerators and microwaves. Wired and wireless Internet access is complimentary, while 35-inch flat-screen televisions with cable programming provide entertainment. Bathrooms have shower/tub combinations and hair dryers. Conveniences include desks and complimentary newspapers, as well as phones with free local calls. lastminute.com has a fantastic range of hotels in Meriden, with everything from cheap hotels to luxurious five star accommodation available. We like to live up to our last minute name so remember you can book any one of our excellent Meriden hotels up until midnight and stay the same night.